Ahead of our Twitter chat tomorrow evening (Wednesday 4th of March from 8pm to 9.30pm), here are the questions we will be asking. We hope this will give you a chance to get your thinking cap on in advance. We will be asking these questions every 10 minutes or so, but the conversation will be semi-structured. 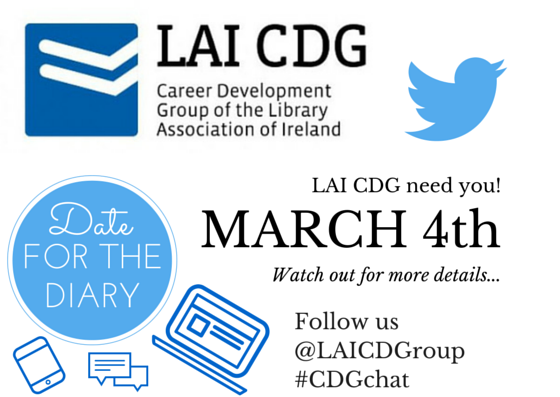 To join our Twitter chat all you have to do it tweet during the chosen time using the hastag #CDGchat. What do you need/want from your CDG? What resources are invaluable to you on a day-to-day basis? What resources do you use for job-hunting? Are there any library roles you’d like to learn more about? Do you work as a librarian in a non-traditional library job? Tell us about it. What skills should be taught in professional Library courses which aren’t covered at present? Have you done any training/CPD courses that you can recommend? What transferable skills are essential to your library job? Ex. Organisational skills, communication skills, management, etc. Twitter is a fantastic way to get to know other information professionals, to keep up date with the latest library news and generally great fun. Signing up is free and easy. 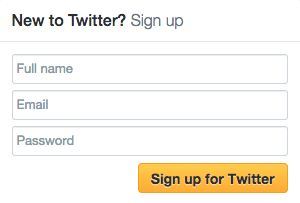 Simply pop over to twitter.com, put in your name, email address and choose a password. In the next step you will be prompted to choose a username, this is unique to you and is the name your followers use when sending @replies, mentions, and direct messages. Once you have created your account you’ll be sent a confirmation email with a link to confirm your account and then you’re good to go. Don’t forget to follow the @LAICDGroup once you have your account up and running. If you prefer to have your account private you can ‘protect‘ your tweets, but for the Twitter chat we recommend unlocking your account to participate more fully. You are cordially invited to join your CDG committee for a Twitter Chat on Wednesday 4th of March from 8pm to 9.30pm. We are really looking forward chatting with you all about job-hunting, skills and non-traditional careers for librarians. So, what’s a Twitter Chat? To join our Twitter chat all you have to do it tweet during the chosen time (Wednesday 4th of March from 8pm to 9.30pm) using the hastag #CDGchat. What will we be chatting about? We hope this will be a great way to let us know what’s important to you with regards to career development as well as to meet and chat with other librarians and information professionals.